Russia’s foreign minister reiterates Moscow’s demand to adhere to the terms of the Feb. 21 agreement in Ukraine. Russian Foreign Minister Sergei Lavrov was making the rounds in Europe on Tuesday and Wednesday, as international negotiations began to find a settlement to the Ukrainian crisis. 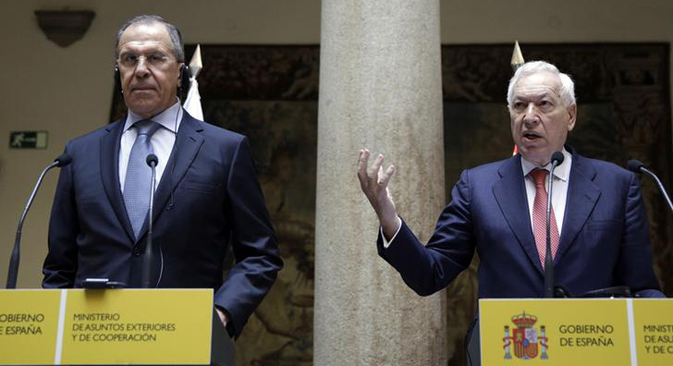 After talks with Spain's Minister of Foreign Affairs and Cooperation José Manuel García-Margallo, Russian Foreign Minister Sergei Lavrov announced, "As our president said, we will do everything we can to prevent any bloodshed, and any act against the life or health of those who live in Ukraine, including Russian citizens." Commenting on those Russian servicemen of the Black Sea Fleet, Lavrov said they are located at the places of their deployment. Lavrov accused the new authorities in Kiev of trying "to speculate on Russia's relations with Western partners" by announcing the deployment of U.S. missile defense units on Ukrainian territory. When asked to comment on a statement from the Ukrainian ambassador to Belarus that U.S. missile defense units could be deployed in Ukraine in exchange for financial assistance, Lavrov said: "As for missile defense, I have not heard this statement," but he continued to say that if the report is true, "we have another example of how, with full complicity of our Western partners, those who now sit in the Verkhovna Rada [Ukraine’s parliament] are trying to speculate on the relationship between Russia and the West and are trying to aggravate these relations, hoping to catch something in the murky waters. Lavrov reiterated Russia’s concerns about the legitimacy of the interim leaders of Ukraine and again stated that Russia would like to see all parties adhere to the Feb. 21 agreement that brought an end to the violence in Kiev. "We hope that those who brought the situation (in Ukraine) to this point will now look for a way out of it. And this is possible on the basis of the Feb. 21 agreement. What was agreed on then should be carried out. One must play fairly and not try to outsmart the other or play games in his favor," Lavrov said. On Wednesday, Lavrov also discussed the events in Ukraine with EU Foreign Minister Catherine Ashton. He announced that Moscow does not intend to change its policy, and criticized the EU and the U.S. for failing to uphold the terms of the Feb. 21 agreement. According to a Russian diplomatic source, who spoke to Russian daily Kommersant, President Vladimir Putin urged Viktor Yanukovich to concede to the leaders of the Ukrainian opposition on Feb. 21 after Western leaders said that they would in turn convince the opposition to adhere to all points of the agreement, including creating a national unity government, carrying out constitutional reform and holding early elections, and surrendering illegal weapons. The source seconded statements made earlier by Polish Foreign Minister Radosław Sikorski about Putin’s role in brokering the deal. "Yanukovych fulfilled all of his obligations. The opposition has not fulfilled anything," the source said. "Now the EU and U.S. are urging us to "look to the future" and pretend that there was no agreement. But we will not do that. We are ready to continue the dialogue with our Western partners, but only if they return to the Feb. 21 agreement, and if all political groups in Ukraine are represented in the negotiations." According to reporting by Kommersant, Moscow will not seek to have Yanukovich return to power, but wants ministerial portfolios redistributed to include ministers who do not support the Euromaidan movement. When asked by reporters to comment on threats of sanctions by Western governments, Lavrov said: "The one who gets angry is always wrong. If our partners in Europe and the U.S. are unwilling to do anything in order to fulfill their obligations regarding the agreements between the government and the opposition, then why should others pay the price of this powerlessness?" Lavrov called Russia's position "honest,” adding, “because of that, we will not change it." This article is based on reporting from RIA Novosti and Kommersant.